In her latest mystery “The In-Laws,” author G.X. Chen takes readers on a lively adventure full of drama, family secrets and betrayal. Initially, Betty Foreman is very excited about her betrothal to Peter. His controlling mother Emily soon puts a damper on her happiness. Emily feels she has a say in the couple’s future because of her culture and the sacrifices that she made for her son. Shortly after the wedding planning starts, Emily appears to take a strong dislike to her future daughter-in-law, Betty. When Emily asks Betty to come to her home a huge argument ensues between the two. Acting out of character, Emily raises her voice, enough for a neighbor to hear, then throws a heavy vase at Betty. What happens afterward remains unclear. The police receive a call from Emily stating that Betty pushed her down the stairs. When Emily subsequently dies from her injuries Betty insists she had nothing to do with it. This case sparks the interest of the author’s tenacious amateur detectives, Ann Lee and Fang Chen. They know Betty and don’t believe she is capable of harming anyone. As they put the pieces together, they quickly discover that Emily was keeping secrets from her son. The clock is ticking down as they hurry to solve this case before it goes to court. 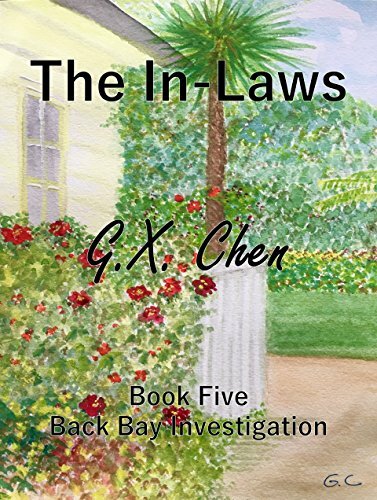 “The In-Laws” is the fifth book in the Back Bay Investigation series by G.X. Chen. Even though I hadn’t read the first four books, in the series, I had no problem following along with the cast of characters in this one. The author does an excellent job of introducing the people and their roles in this story. Ann Lee and Fang Chen are characters that are fun to follow and genuine. The mystery is unique, in that it involves Chinese culture. I loved this aspect of the story, because it made the characters more original and added an authentic appeal. To add more flavor to the investigation, one of the characters has to go to China to seek answers. These extra touches and the unusual ending make this a very different kind of story. I highly recommend reading “The In-Laws” by G.X. Chen. The other four books in the series also look intriguing!